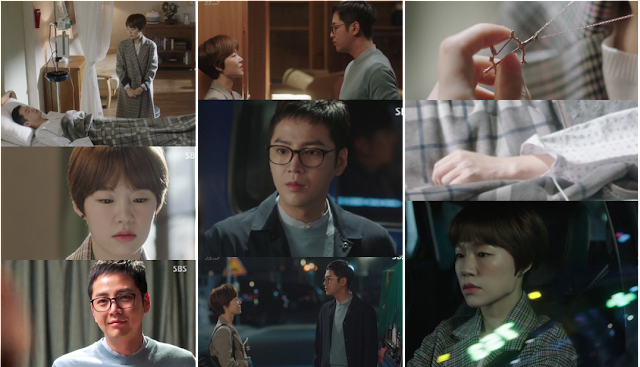 Episode six begins with Oh Ha-Ra visiting Baek Joon-Soo in the private clinic. The medical practitioner informs Ha-Ra that although Baek’s vital signs are stable, he remains in a coma. He has not woken even for a brief moment. Ha-Ra sits down at his bed side and reveals to Baek Joon-Soo how she feels about his return to Seoul. While she fondles the Justitia balancing scales of her necklace, Ha-Ra’s memories go back to the day when she had to say goodbye to Baek one year ago. Baek had been set up and was forced to leave Seoul. Before leaving, he allowed Ha-Ra to keep his statue of Lady Justice, Justitia. She would return it to him when he returned to work. Ha-Ra now wears the scales as a token of her feelings for Baek. She promises Baek that she won’t give up on the case. She also tells Baek about So Do-Chan and how she ended up working with a weirdo who is very clever and jokingly says, “If you don’t wake up, I’ll keep working with him. You may not have a job to return to.” She wishes him to wake up soon, then leaves after dark. As Ha-Ra drives home with a despondent look on her face, the middle finger of Baek’s left hand begins to twitch. Meanwhile in Do-Chan’s apartment, the team are lounging around. Director Bong is thoroughly enjoying the massage chair when Do-Chan barges in with a new assignment. To meet with a diplomatic drug mule, Cha Myung-Soo, a name that came up in Baek’s file. The stage is set in a drinking establishment. Jeon In-Tae walks over to the bar next to Cha Myung-Soo and waits for Cha to be distracted. Director Bong pretends to have a heart attack while So Eun-Ji claiming to be a nurse runs to his aid. While Cha is preoccupied with the help being given to Bong, Jeon connects Cha’s phone to his high speed downloading program device. Just before the download is complete, Cha turns around to find his phone missing. Quick thinking Jeon throws it to Eun-Ji who then hands it back to Cha, claiming she had found it on the floor. Mission accomplished. In the office of the Supreme Prosecutor, Jung Do-Young stands by the window recalling his previous meeting with Geum Tae-Woong, discussing suspicions that right now they are dealing with a fake Baek Joon-Soo. Based on this information, Jung calls prosecutor Gil Dae-Ro to his office and orders him to investigate Baek Joon-Soo. Gil Dae-Ro has been given the task to look into Baek’s history. He asks a favor from one of the civil servants in the General Affairs section, to give him access to Baek Joon-Soo’s personal file. She refuses at first as he needs to provide proper authorization, but Gil’s temper quickly changes her mind. Eventually Gil acquires the information he needs, unbeknown to him that Sa Do-Chan has been watching every moment. On the way to his office, Gil Dae-Ro meets Investigator Go and reprimands him about walking past a used juice cup sitting on the window sill. Gil accused Go of having no conscience. Gil walks away leaving a dumbfounded Go to clean up the rubbish. After work, Investigator Go and Do-Chan meet in a Pojangmacha. Go intends to buy Do-Chan a drink to account for his previous actions. He feels very uncomfortable for suspecting Do-Chan for a fake prosecutor Baek. While pouring Go a shot of soju, Do-Chan tells Go how much he admires and respects his decision to stand up for what is right. He even calls Go his older brother. Go is so deeply touched that he cries, admitting he has not worked for any other prosecutor who has shown such respect like Do-Chan has done. Do-Chan then proceeds to ask Go for a favor. He needs Go to investigate a closed case that happened on May 5th 1998. The case was ruled as a suicide, the victim's name being Sa Ma-Chun. Moreover, he asks Go to keep it a secret from Oh Ha-Ra. Strolling through the streets on his way home, Do-Chan passes a shop selling pet aquarium fish. His mind wanders back to his childhood, to when he decided not to follow in his father’s footsteps as a con artist. In an attempt to help an elderly lady retrieve money she had borrowed from a loan shark, Do-Chan and his father had set up a scheme that would ensure she would be free from her debt. DoChan’s father had asked the target, a pharmacist, if he would watch over his fish while he goes inside the bank to ask for a loan. Thinking this a rather odd request, the pharmacist agrees. Next, a young boy comes into the chemist asking to buy health supplements for children. The child notices the fish and becomes extremely excited, saying it is a Platinum Arwana and it’s very expensive. This freshwater fish is meant to bring luck and prosperity to its owner. The boy, Do-Chan, continues to tell the pharmacist that his dad is a marine scientist and will happily pay him $5,000.00 for it. Do-Chan is told that he will need to wait for the owner to return. As the boy runs off to find his dad, the owner of the fish returns to the chemist looking very disheartened. The pharmacist offers to buy the fish for $1,500.00. Do-Chan’s father accepts the offer. Do-Chan’s father then hands the elderly woman her money in an envelope and insists that she never borrows money from that loan shark again. Oh Ha-Ra arrives home that night and finds her mother sleeping on the couch. She wakes her up and suggests that she goes and sleep in her bed instead. Her mother replies that she was waiting for her daughter to come home. She them cooks Nurungji (scorched rice) for Ha-Ra, but when she brings it to Ha-Ra, she finds her daughter already fast asleep without even changing her clothes. Her mother worries that she works so hard. The next day in the Prosecutor’s parking lot, Do-Chan and Ha-Ra meet senior Gil Dae-Ro who is about to go somewhere. Ha-Ra asks if Gil will be attending the District Prosecutor’s birthday event. He smiles widely and says of course he will attend the event, and added that he already prepared a big present for him. Arousing suspicion, Do-Chan makes a mental note of the license plate number of the car. Meanwhile in the local Emergency Medical Center parking lot, Jo Sung-Doo and his men confront an ambulance officer and demand to know where he drove Baek Joon-Soo. The officer feels threatened and says he doesn’t know Baek, but they do not believe him. When So-Ra comes home from work, Ha-Ra’s mother shows her a some photos of successful older gentlemen that she thinks would be a suitable match for Ha-Ra. Oh So-Ra insists that her sister only likes Baek and feels sure that there is something going on between them. Her mother doesn’t like it and then bribes So-Ra to do whatever is necessary to separate them. She will buy So-Ra a new expensive hand bag if she succeeds. That night, at A Table Of Five Colours Restaurant, the prosecutors arrive to celebrate the District Prosecutor's birthday. Everyone has arrived, but Ha-Ra and Chief Yang are still waiting for Sa Do-Chan. When Do-Chan finally does arrive, he walks straight into the room past Gil Dae-Ro and another man. While he acknowledges Gil, he ignores the other man. Senior Gil exchanges glances with the man and a smirk forms with his lips. The birthday Prosecutor Jung. After awhile, Do-Chan excuses himself, presumably to go to the restroom. Concurrently, Jo Sung-Doo and his gang search for Baek throughout the hospital. They thoroughly search through every room. Frustrated, Jo calls Geum, reporting that Baek is no where to be found. As he waits for Geum’s instructions, Jo notices a restricted area. They head towards that section of the hospital grounds. Back in the restaurant, Do-Chan returns back from the restroom. Right on queue, Prosecutor Gil stands and announces he has a big surprise for Jung. He says that something so shocking which cannot and must not happen is happening in the Seoul Central District Prosecutors Office and points to Baek Joon-Soo. Gil went on further, accusing him of not being the real Baek Joon-Soo but an imposter. Everyone registers shock, especially Chief Yang and Oh Ha-Ra. Prosecutor Jin Kyung-Hee feels Gil has gone too far with this inappropriate insult, but Gil insists that he has the proof. Gil, then, introduces the man who was with him in the hallway as Shin Jang-Hoon. Baek’s classmate from high school. Senior Gil reports that Baek walked right past him earlier without even acknowledging him. Baek explains he did that because he is with his co-workers and apologized if he has hurt Shin’s feelings. But Senior Gil continues on further, revealing that both Baek and Jan-Hoon were burnt while playing with fire when they were young. Jang-Hoon rolls up his shirt sleeve to reveal a large scar on his forearm. Jang-Hoon discloses that Baek’s burn is on his left shoulder blade, in the shape of a lightening bolt. Prosecutor Gil demands Baek reveal his scar. Frustrated with Baek’s composure, he pulls Baek’s sleeve to at least force Baek to stand up. The atmosphere in the room is apprehensive, to say the least. Do-Chan, revolted by the way he is being treated, tries to remain in control. Chief Yang and Ha-Ra, however, find it very difficult to compose their reactions. Neither of them is prepared for Do-Chan to be exposed right now. His exposure would reveal they are his accomplices. In order to break the tension, Jung orders Baek to show his scar if it means to thwart the accusation. Slowly Baek stands up and announces, “If you want to see it that badly, please excuse me.” Baek angrily removes his tie. Under protest, he then continues to unbutton his shirt. Allowing the shirt to fall just below his shoulder blades, he turns his back to the audience revealing his scar. The scar on his left shoulder blade, in the shape of a lighting bolt, clearly visible to the rest of the prosecutors to see. Everyone gasps in surprise, particularly Chief Yang and Ha-Ra. They can not believe their own eyes.